Stone Technical Services (STS) is working on a number of high profile projects across the UK, worth in the region of £500,000 to the Darlington-based company which is this year celebrating its 20th anniversary. STS, building restoration, conservation and maintenance experts, has been appointed as a national framework partner to facilities giant Mitie, following a rigorous approval process. As a result, STS is working on a variety of projects including stone flooring repairs at Holyrood in Edinburgh and works for the Ministry of Justice across the South of England. In London, STS is returning to Westminster Central Hall to work on another project at the site (pictured above), as part of a long-running partnership to refurbish external netting and sandcast lead coverings and also complete a survey of the internal tower. And STS has been appointed as a leading contractor on the historic Carillon Tower near Loughborough. Working for Charnwood Council, STS is carrying out a specialist clean of the stonework, masonry repairs and refurbishing windows. Carillon Tower dates back to 1923 and honours the men who fought in the First World War. The tower itself is 150 feet high. 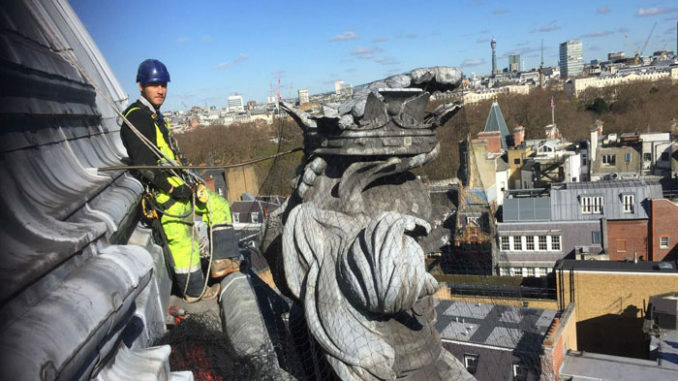 The new contracts come shortly after STS completed a major project at St Paul’s Cathedral, providing specially-designed scaffolds for the refurbishment of the bells to limit disruption to the day-to-day running of the cathedral. Managing director Dave Stone said: “STS is thriving thanks to the experience and commitment of our team and our far-reaching reputation. We’re working on some incredible projects involving all of our divisions. STS started 2018 by investing hundreds of thousands of pounds in its fleet of vehicles as contracts around the UK continue to increase, and as it marks its 20th anniversary. Last year saw STS experience its most successful 12 months to date with a 20% year-on-year growth, with turnover up from £2m to £3m in the last year.